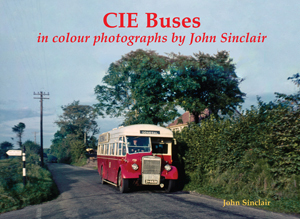 This is a delightful collection of colour photographs by Scottish bus enthusiast John Sinclair. Inspired by a Buses Illustrated frontispiece featuring Dalkey, John made the first of several trips to Ireland aged 16 in 1958, returning armed with a camera in 1964, 1984, 1985 and 1994, on these latter occasions not needing to stow away on a boat to get home for lack of funds. Locations featured include Donegal, Cork, Achill Island, Galway, Ballina, Tralee, Kenmare, Dublin, Drogheda and Clonmel.